An ambassador says the agency is suffering from retrenchment and sagging morale. The U.S.’s ranks of diplomats are losing key leaders at a “dizzying speed” as the State Department struggles to recruit talent amid a hiring freeze and sinking morale in the Trump administration, according to a new essay from a top ambassador. Three of the agency’s five career ambassadors, the highest rank for diplomats, have retired or quit since January. Nearly half of career ministers — the next level down and equivalent to the military’s three-star generals — are gone too, down to 19 from 33. The next-level minister counselors have seen their numbers drop by 62 diplomats, to 369, since Labor Day “and are still falling,” writes Ambassador Barbara Stephenson, the president of the American Foreign Service Association union. “There is simply no denying the warning signs that point to mounting threats to our institution — and to the global leadership that depends on us. There is no denying that our leadership ranks are being depleted at a dizzying speed,” Stephenson, who has headed AFSA since 2015, writes in a new essay in the group’s monthly publication. AFSA rarely makes forays into political issues, making Stephenson’s essay that much more surprising. But there has also been a sharp impact on the next generation, AFSA reports. A department-wide hiring freeze prevents new employees from coming on board and limits current employees’ ability to take on new roles unless granted special permission. In 2016, 366 new foreign service officers were admitted, and only about 100 will join in 2018, according to AFSA. What’s worse, Stephenson said, is that interest in joining the foreign service is plummeting because of these policies. More than 17,000 people applied to take the foreign service test in 2015, according to AFSA, but fewer than half that number have taken it so far this year. There are 976 diplomats in the senior foreign service -- the top four ranks -- compared to 1,058 at the same point in 2016, according to a State Department official. Sixty-three more diplomats are waiting for their promotions to be confirmed, for a total of 1,039 -- “a number nearly identical” to last year's, the official said. AFSA maintains that its numbers come from the State Department’s Human Resources bureau, which is what the State Department said as well. It’s unclear why there are different numbers. While the union — as well as many outside the government — is raising alarms about the situation, Trump has made clear that he does not see the need to fill many of the roles or build talent. That redesign began with an employee survey and hundreds of staff interviews, led by an outside consulting firm, to hone the department’s focus and mission, Tillerson’s team said. Until it is complete, he has imposed that hiring freeze and left several top roles vacant or filled by staff in an acting capacity. 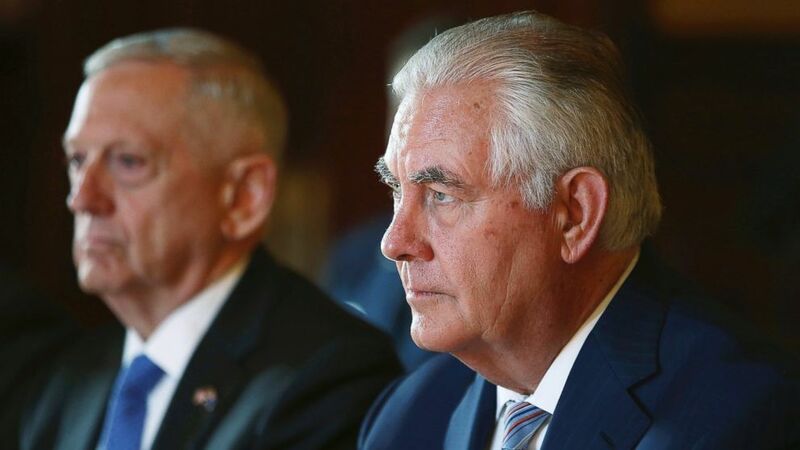 (AP) In this June 5, 2017, file photo, U.S. Secretary of State Rex Tillerson, right, and U.S. Secretary of Defense Jim Mattis participate in talks at Government House in Sydney. But to foreign policy hands, he is depleting the nation’s diplomats, which will diminish America’s role on the world stage — or lead to a heavier reliance on the Pentagon at a time when the military is already stretched thin by two wars, in Afghanistan and in Iraq and Syria, as well as conflicts in other hotspots around the world. “It’s called cost saving. There’s nothing wrong with cost saving. Rex is in there working hard. He’s doing his best,” Trump told Fox News last week. If Trump seems to have any concern about staffing at the State Department, it’s that there are not enough of his people in the agency to implement in the America-first vision he promised — agreeing with conservative commentator Laura Ingraham on that point in the Fox News interview. So far, the Trump administration has only seven high-level political appointees confirmed by the Senate and working in the department — outside of Tillerson but including USAID Administrator Mark Green and Deputy Secretary of State John Sullivan. Eight nominees are working their way through the confirmation process, with the Senate awaiting their paperwork or the nominees awaiting a Senate hearing or vote. But in the absence of Trump appointments, there are 30 senior roles filled by career diplomats in an acting capacity. Although there are people doing the work, they do not enjoy the full legal authority of their role or the image of speaking on the administration’s behalf to the world. There are 39 other senior roles that are vacant, but Tillerson has said he plans to eliminate 18 of those and fold their responsibilities into other jobs. The Trump administration has nominated someone for one of those 39 roles — the chief of protocol — who is awaiting confirmation.